Version 16.04 is now available for download. Added Normalize: One Pass audio filter (existing Normalize renamed Normalize: Two Pass. Added Audio Loudness to View > Scopes. Added Brightness video filter for CPU and GPU. Added Contrast video filter for CPU and GPU. Added Reduce Noise video filter for CPU only. Added More Information to clip Properties overflow-menu. Added Start Integrity Check Job to clip Properties overflow-menu. Added auto-rotate for video clips with orientation metadata. Install ffplay and ffprobe executables. Fixed frequently reported problem with black video on Export. Fixed a few crashing bugs. Added an option to Windows installer to remove registry settings to help people with new crash-on-launch problems. Reduced memory usage when exporting a playlist or multitrack project. Improved visual feedback about what is selected in Timeline, Properties, and Filters views. The previous audio normalize filter has been renamed to Normalize: Two Pass. Its functionality has not changed. This type of normalization is most appropriate for previously mixed clips like music. The new Normalize: One Pass filter analyzes the audio in real time as the clip is played and adjusts the gain on the clip in real time in order to achieve the target loudness. Unlike the two pass filter, the one pass filter can be applied to an entire track as well as a clip. This filter is most useful for clips where the audio has not been mixed, or its volume changes varies a lot. Also, because the filter is being applied dynamically, and it is reacting to historical loudness, it may not actually achieve the target loudness with high accuracy. Therefore, the two pass filter is still better applied to a number of consistent or pre-mixed clips to bring them all to the same level. 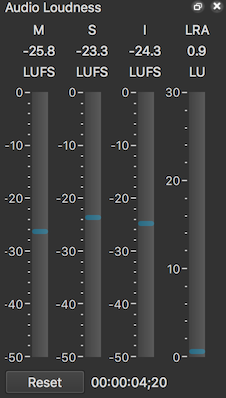 To complement the normalization filters, a new Audio Loudness scope has been added to the View > Scopes menu. It shows the Momentary, Short-term, and Integrated loudness as well as the Loudness Range. While it has been possible to use the Color Grading filter to adjust video levels, it has a limitation to lowering the black level, and it is not really obvious to most users how to increase contrast. So, we added Brightness and Contrast filters that work both with GPU or CPU processing. The new Reduce Noise filter can be useful for reducing noise or film grain in a source clip. MLT – the engine of Shotcut – actually now supports FFmpeg filters! And this is the first Shotcut fitler to use that capability. This filter is actually the FFmpeg libavfilter smartblur. The Properties panel for a clip has a menu button (sometimes called a hamburger menu). This is an overflow menu that contains advanced or seldomly used actions without cluttering the user interface. A new menu item More Information runs the FFmpeg ffprobe utility against the clip to show many more attributes available. Another menu item Start Integrity Check Job adds a job to the Jobs view that runs the ffmpeg utility to read and decode everything in the file and report any errors. This is handy to see if a problem you are having may be linked to a corrupt file. We’re always trying to improve in these areas. A few crash bugs have been squashed such as when trimming on the timeline. Some Windows users have also been reporting a crash-upon-launch when Shotcut used to previously start with no problem. We still do not know the cause, but we learned that something in the registry settings is triggering the problem. Most people with this problem reported having attempted to reinstall Shotcut. Therefore, we added an option to remove the Shotcut registry settings to the installer. We hope that will help people rescue their installation. A number of people have reported that the exported video is all or mostly black silence. This has not affected any of the developers making it go undetected and unresolved for a long time, but we finally determined the cause and fixed that. Subscribe to this blog via RSS. 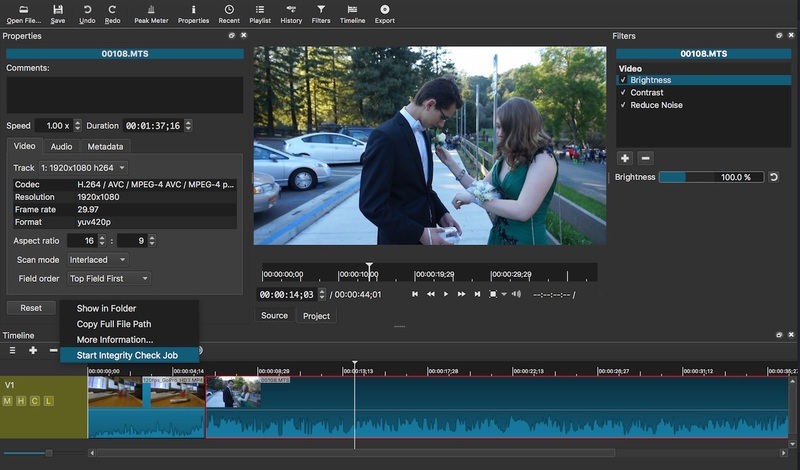 Shotcut is a free, open source, cross-platform video editor for Windows, Mac and Linux. Major features include support for a wide range of formats; no import required meaning native timeline editing; Blackmagic Design support for input and preview monitoring; and resolution support to 4k. Shotcut is a trademark of Meltytech, LLC. Site design by Magnetic Image.